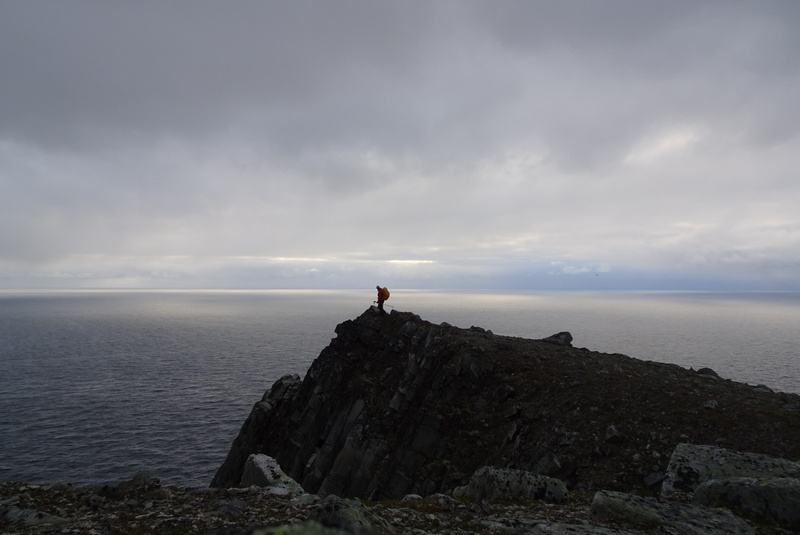 Kinnarodden is the last ragged edge of the continent, rising five hundred feet in defiance above the Arctic Ocean. I stand alone at the point, as if on the prow of some mighty stone ship, feeling small surrounded by the tangled weave of sky, rock, and water. The Arctic curves away, bending to the horizon like a blue-grey sheet stretched across the Earth. Waves break below in an endless parade of white foam against the black rocks, gnawing at the land, continuing the endless battle between sea and stone. The sun circles in the North, watching over it all. It never touches the horizon, even now, a few hours past midnight. It’s like the hand of a clock ticking away, circling once every twenty four hours. I think of time. Of seconds, hours, days slipping by. Today is the solstice. The sun has marched as far north as it will go. Tomorrow it will begin its long descent south. I must go with it. I must keep up. I turn my back to the sea and think of Europe stretched out in front of me, waiting beyond a hundred horizons. I think of the cities, the mountains, the forests, and beaches. I think of the people, the rivers, the thousand trails I will follow, the languages I will hear. Images flood through my mind, filling the barren landscape in front of me. I push them away and stare at the tundra and stone of the Arctic, the shattered rock stretched to the horizon. It’s the only real thing in all of it. I have no idea what waits beyond the next horizon. The old churches, the French bakery, the point Pyrenees rising to divide countries. It’s all nothing to me but my imagination until I make it real. I look back one last time at the sea, at the sky, at the edge of a continent, then turn and walk south toward the next horizon. Posted in Europe North to SouthTagged adventure, backpacking, ENS, Europe North to South, featured, hiking, Kinnarodden, Mehamn, nordkyn, Norway, Predictably Lost, thru-hikingBookmark the permalink. Keep plugging away, Brother. I’m busy trying to think of ways to intercept your trip with some STEAKS! 🙂 Or ice cream. Actually, the Snickers Bars in Germany put the A in A-mazing! Haha! I will definitely be sampling all the chocolate as I go! Walk safely my friend and thank you again for sharing another journey! Kit and I just returned from a cruise around the Baltic, generally east of your route (Copenhagen, Rostok/Berlin, Tallinn, St Petersburg, Helsinki, Stockholm, Kiel/Hamburg, Gothenburg, and Helsingborg). We had glorious weather for 12 straight days; never donned my raincoat! Sure hope this great weather holds for you! We’ll be following you, My Friend! PS And thanks for the pic w/ JB at Flamingo! So you stole all the sunny weather? Hopefully it will head up here now! who’s taking these great photos of you? I take them with a timer! Some running involved for the far away ones! know it will be another amazing chapter in your journeys across the world! I continue to be a big Fan! Loved it D. Your description placed in Norway. I look forward to savoring and learning from your journey .